Have you OD'ed on chocolate yet? 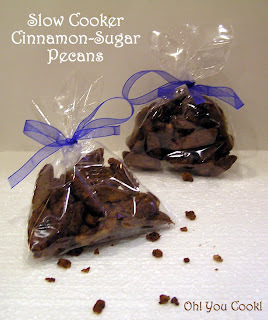 Thought I'd give you a break, Dear Reader, and provide you with something less Valentine and more Purim ... with delicious packets of candied pecans, perfect to slip inside your mishloach manot baskets. I had posted a while back on how to make Cinnamon and Sugar Almonds. Delicious they may be, the baking part is a little messy and a lot hands-on (more correctly electric mixer-on and spatula-on), what with stirring and foil ripping every 15 minutes until finally, they are done (along with a pile of aluminum tinsel, no extra charge). With today's recipe, you simply toss the ingredients in a crock pot and stir pretty much whenever you feel like it. And since you don't have to beat the egg whites into a lather, there's no separation anxiety if a drop of yolk sneaks in. Mucho much easier!